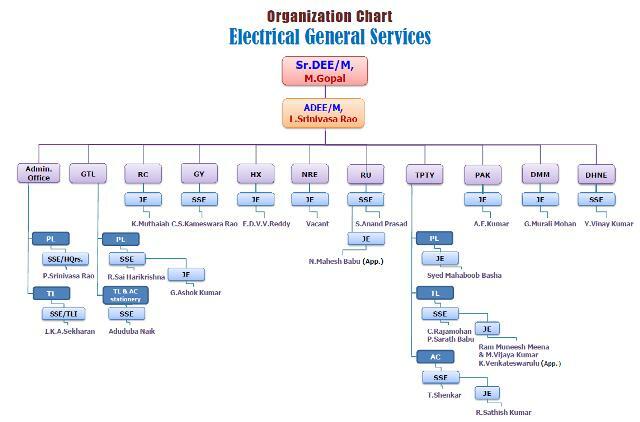 Electrical Maintenance organization is one of the branch in Guntakal Division entrusted with Maintenance of all Electrical Equipments working on voltage up to 11,000 Volts. 141 Electrified Stations and Train lighting & Air conditioning depots over the division. 37 Nos. of 11KV/440 V Sub-stations. 68 AC Coaches and 499 Non AC Coaches. Un-interrupted power supply at 112 PRS / UTS locations. Fans & Lighting arrangements at all stations, Staff quarters, service buildings and pump houses. Electrical General services is headed by Senior Divisional Electrical Engineer (Maintenance) and assisted by Assistant Divisional Electrical Engineer (Maintenance) looking after Train Lighting, Air Conditioning and Power Maintenance. For maintenance of Coaches, Main depots are located at Tirupati and Guntakal. There are 09 Main depots located at Guntakal, Raichur, Gooty, Kadapa, Nandalur, Renigunta, Tirupati, Pakala, Dharmavaram & Dhone to look after maintenance of power equipments / installations at 141 stations over the division. 03 Nos. of passenger lifts were provided at Tirupati for the convenience of passengers. ·16 Mtr. long High Mast tower lights were provided in the circulating areas at Tirupati, Renigunta, Sri Kalahasti, Kodur, Venkatagiri, Anantapur, Dharmavaram, Kadiri, Gooty, Guntakal, Chittoor, Pakala, Yadgir, Adoni, Mantralayam Road, Raichur, Cuddapah, Dhone stations. ·16 Mtr. long High Mast tower lights were provided in the loading / unloading area at Tadipatri, Hagari, Bethamcherla stations. At all A1, A, B & D category stations Laptop / Mobile charging points provided at important locations viz., Waiting halls, Platforms, Retiring rooms, Concourse areas etc. LED based lighting in General Service applications have been provided intensively too. 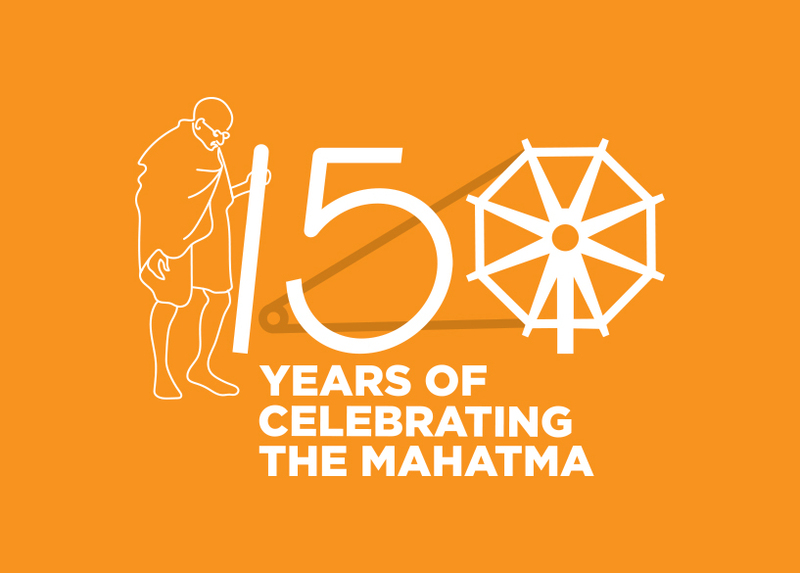 Under Clean Development Machinery (CDM project) 16431 Nos. of CFLs have been distributed among staff residing in Rly. Qtrs. at all stations to bring awareness for usage of energy efficient fittings and as a measure to conserve electrical energy. 25 Nos. Energy efficient pumps have been commissioned in place of old and inefficient pumps over the division during the year to conserve energy. <?xml:namespace prefix = w />1131 Nos. 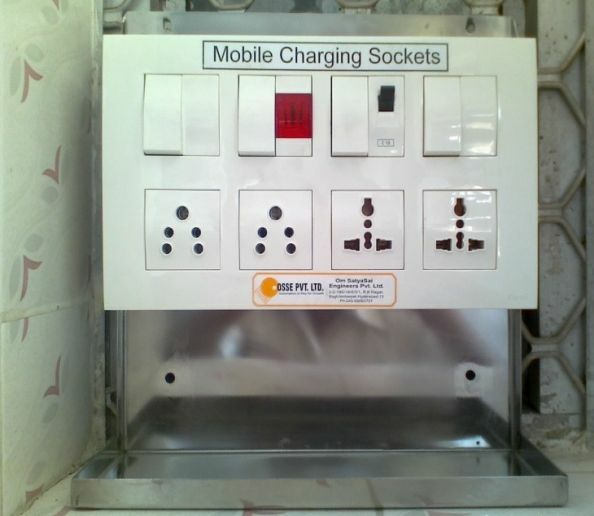 of Star rated electrical equipments of 3 Star rated and above were provided such as AC plants, Geysers, Pumps, Ceiling fans etc., in waiting halls, retiring rooms, service buildings etc., where consumption is normally on higher side. 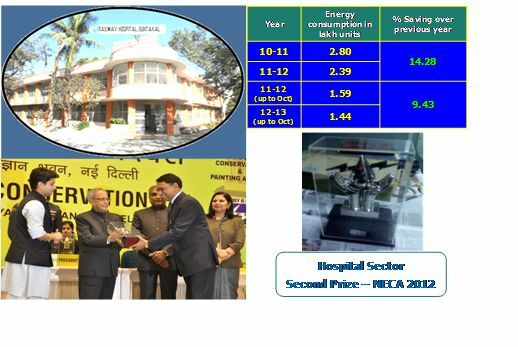 Replacement of conventional type items with energy efficient items during the year. Automation of pumps with GPRS Technology at 3/3 pump house at Pakala have been provided to save man power and saving of energy. 30% & 70% Platform lighting automation with Signal interlocking has been commissioned at Raichur, Guntakal, Gooty, Cuddapah, Rajampeta, Anantapur, Dharmavaram, Renigunta, Tirupati & Dhone stations (10 stations). This will save man power as well energy. Provision of 50 Nos. electronic over current relays in pumping installations to reduce pump failure. <?xml:namespace prefix = st1 />Eddy Dyno Drive: 75 HP VVVF drive has been commissioned at IOH shed TPTY for ensuring generation of 25 KW alternator and load sharing of alternators in AC coaches. VVVF Drive: 10 HP VVVF Drive for testing of 4.5 KW Alternator has been commissioned at Tirupati. 36 Nos. of Electro pneumatic Time Delay Relays in 18 AC coaches were replaced with SELEC Make Electronic TDR in RMPU’s. pre-cooling of AC coaches to provide comfort at originating stations. Non-AC Coaches at Tirupati to ensure proper working of Lights & Fans in coaches. At 5 major locations Energy auditing has been done for load centers, Sub-stations, pumping installations, station lighting over the division. Major assets maintaining by the GTL Divn. Primary maintenance of 495 TL coaches and 64 AC coaches are under taken at Tiruapti and Guntakal depots.